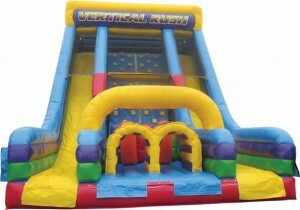 The Vertical Rush inflatable slide is the second largest slide we offer (see Titanic Slide). The climb is tough but the super fast slide and a unique climbing experience make it worth it! Sometimes used as an indoor option for a rock wall, the climb is not easy, that’s why there is a 42″ height requirement to ride. Must be at least 34” tall. 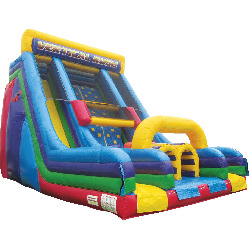 Two opponents begin their assault when entering a tunnel and bashing their way through vertical inflatable tubes only to be confronted with an extreme inflatable climbing wall with mounds.